We could define Open Science policies as those strategies and actions aimed at promoting Open Science principles and at acknowledging Open Science practices. Those policies are usually established by research performing institutions, research funders, governments or publishers. The initial policies were aimed at requiring an open dissemination of the research results based on the idea that results achieved from publicly funded research should be available to the public without any restriction. However, now the scope of the policies has grown and we may find national policies fostering Open Science practices at any point of the research level. Moreover, we might find specific provisions in new and existing laws, regulations or directives. Since one of the main drivers to Open Science are the current policies established by institutions, funders, governments and publishers, it is important to know how they affect any researcher. If you are planning to design a policy aimed at the adoption and acknowledgement of Open Science practices is important to know the existing policies in order to avoid any overlapping or contradiction. Therefore researchers and policy makers should have a knowledge of the current policies and should be able to understand how they affect them. Depending on your audience the objectives of the training session would be different. We can make a broad division between researchers (in a broad sense) and policy makers (within an institution or funders - in a broad sense). If your training program is addressed mainly to researchers, including all "levels", then the main objective is to review how Open Science policies affect them. If your training program is addressed to policy makers, you might focus in designing and implement a policy to foster Open Science. You must review all the policies that affect your training audience. First of all check all the institutional policies at institutional level, for instance; copyright, intellectual property, open access, research data. Secondly you may review any national policy or law that can affect researchers when performing Open Science, for instance laws with open access provisions or decrees affecting PhD dissertations , Call for projects. At the national level there could be some laws or decrees that directly or indirectly could influence a policy or pose some requirements. For instance you could review the national open access policies in Europe available at OpenAIRE. Since science is international, then we should review any international policy that could affect your audience, mainly coming from international funders. At the European level we have the policies coming from the H2020 research Framework regarding the dissemination of research outputs but we could have other policies affecting other parts of the research cycle. Also at the international level, some publishers have introduced new policies, especially regarding the publication of research data when submitting a paper. If your training audience is willing to develop a roadmap or agenda to implement a national Open Science policy it could be advisable to benchmark what has been done in other parts. As a starting point, the 2016 Amsterdam Call for Action could show some of the issues that must be taken into account and to whom are addressed. Examples of the Netherlands, Portugal, or Finland can help to plan national policies, outline some actions and find how to measure their implementation. Trainees would need to identify the main features of each policy mainly: to whom is addressed, what are the requirements, how they overlap with each other. You might show how researchers can fulfill with the different policies: where are the services, the tools that the institution can provide but also where they can find alternatives. For instance, an institution might not provide an infrastructure for depositing and publishing research data; but it can point out external solutions that fulfill policy requirements. It is also useful to compare those solutions with other external options with not desired features. When designing an Open Science policy, trainees would need to be able to define the main purposes of having such a policy and to establish the goals or changes they are pursuing. Once defined, they must be able to find key performance indicators to measure if the policy have achieved its goals and they must be able to review and update the policy if the goals are not achieved. The main question coming from researchers in training sessions on policies is how they can fulfill the requirements without losing any freedom on deciding where to publish, for instance. You as a trainer, may describe all the available options researchers have because in general, Open Science policies provide a range of options. Another question often raised is what happens if researchers don’t fulfill the requirements. In this case you may give examples of projects monitored by funders or warnings received by researchers. 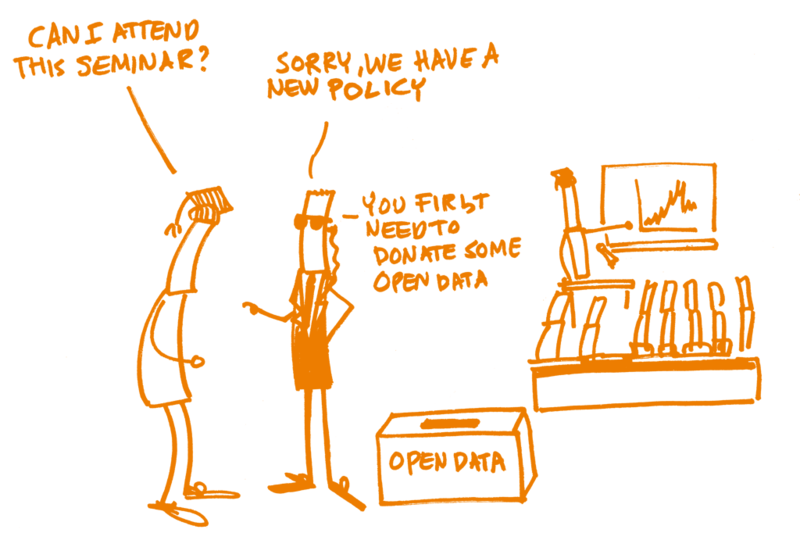 A common misconception regarding research data policy is that researchers should share all data openly. To overcome it, you must highlight the different excerpts in the text of a policy where there are explanations about which is the data affected by the policy and when it must be shared. We might also remark all the opt-out choices that policies include. A good resource to clarify those issues can be an infographic like the one available from Horizon 2020. When planning a policy is important to know what do you intend to achieve or solve. Sometimes policies are created following other initiatives without thinking if there is a need for another one and if your new policy will overlap other existing ones. The main challenge when creating a policy is to align it with other initiatives and to avoid contradictions with laws or regulations. Trainees would be able to identify the requirements of any policy that could affect them when performing Open Science. They would be able to distinguish among general policies like copyright or data protection and specific policies related to Open Science, for instance regarding how to disseminate research outputs. They would be able to outline the steps to fulfill a certain policy. Trainees attending a session aimed at policy making would be able to plan an Open Science policy, establishing objectives and indicators to measure its implementation.